Alsco Locker Systems are available in a variety of sizes and styles, suitable for New Zealand workplaces. They are crafted from carefully chosen materials that allows your workplace to stay clean, safe and above all organised. 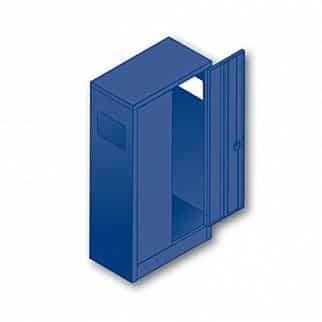 Your workplace needs this wide 3-point locking soiled garment locker. It has infill panels are made of high-quality steel that fills the gap between lockers and walls. This locker features sloping tops with 30° stop dust settling that refrains the formation of dust, raise plinths with 150 mm off the floor for easy cleaning, and flush end panels that leave you a cleaner end on the floor. Infill Panels – Steel panel to fill space/gap between lockers and walls. Sloping Tops – 30° stop dust settling on top of lockers. Flush End Panels – Creates a clean end on a bank of lockers. We also have the Soiled Garment Locker that goes with infill panels made with steel that fills the gap between lockers and walls. Raised plinths with off the floor enable easy cleaning and to avoid dust build-ups. "...took care of all our requirements, in one hit, fantastic!" The continual support they offer on a weekly basis is fantastic, I know they are only a phone call or email away should we need anything further. I found having a company that took care of all our requirements, in one hit, is fantastic! I needed overalls for our staff, first aid supplies, eye wash stations, bathroom and kitchen supplies as well as mats and signage. All of which was done for me, and continues to be monitored. I wouldn’t hesitate in recommending Alsco to any company that wants a professional service day after day."